Since 2004, Jim Click, Jr. has initiated five raffles* for charities in the Greater Tucson area and has donated a vehicle as the raffle prize. Eligible 501c3 charities have been encouraged to sell tickets for the raffle with each charity keeping 100% of the proceeds raised. The raffle has been one of the many ways the Click family has been able to give back to the community that has given his family so much since they came to Tucson in 1974. This year, Mr. Click is donating a 2015 Ford Mustang, 50th Anniversary Edition. The iconic Mustang, an American muscle car, burst onto the scene in 1964 and never looked back. 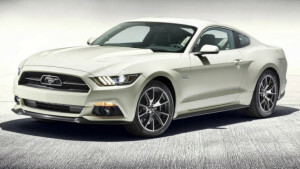 The Ford Motor Company is building exactly 1,964 of these vehicles that are based on the GT coupe and offered in Kona Blue or the original Wimbledon White of the first Mustang sold in 1964. To give you an idea of just how exclusive this vehicle is, consider this: Bill Ford, CEO of the Ford Motor Company, will take possession of the very first one. Other Ford executives have lined up but the vast majority will be sold to the public. The MSRP is $48,190 but already people are starting to pre-order them all over the world and are offering to pay tens of thousands of dollars over the list price! This vehicle is expected to go up in value, significantly, and is considered to be a collectible. Visit millionsfortucson.org for more information. *Previous raffles have raised millions of dollars for local charities.